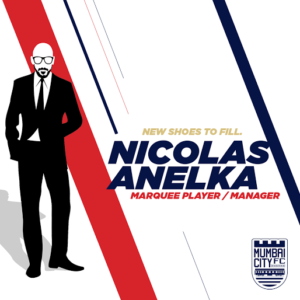 Mumbai City FC announced today that former French international Nicolas Anelka has signed as the club’s marquee Player/Manager for the upcoming Indian Super League season. The club made the announcement through their official Facebook page today, with a cool Tarantino-style poster featuring Anelka and the tag-line “New shoes to fill”. Anelka assumes the role of manager replacing Peter Reid, who led the club to a disappointing 7th place finish in their inaugural season. Fans of the club will be expecting a great deal from Anelka, in delivering them a finals berth in this year’s competition. Anelka, who scored two goals for Mumbai City during the previous ISL season, has featured for a variety of clubs during his career including Manchester City, Real Madrid, PSG, Chelsea, Arsenal and Shanghai.